This is one of some supermarket succulents I got to put in some smaller flowerpots outside in hopes that they'd do better than non-succulents in the heat and scorching sun. This is the first plant that has survived more than a month in this flowerpot. Others get baked to death when the summer hits no matter how much we do or don't water them, this one has grown and put out branches! Whatever it is, it not only handles draughts, but also floods (we forgot to move it when we had a week of extremely heavy rain). When I got it, it looked like a rosette of leaves coming directly out of the dirt. But as it grows taller, you can see that is has a stalk. As the leaves get bigger, they develop a thin red border and a little pointy tip. Obviously if it came from a supermarket it is a common plant. But this one is special for not only staying alive through the worst of a southern summer, but thriving! So many of our plants look droopy until autumn brings an end to the heat, but this one looks as happy as it could be. I'd love to know what it is called, though right now I just call it a Survivor and am trying to propagate cuttings of such a wonder-plant. Thank you! 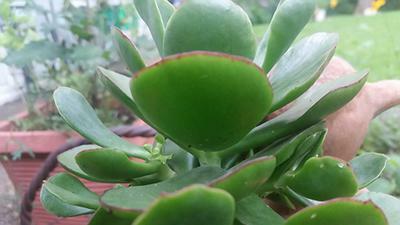 This is most likely the Flapjack plant - they show some variable characteristics, and a lot of them are pink or red around the edges of the leaves. 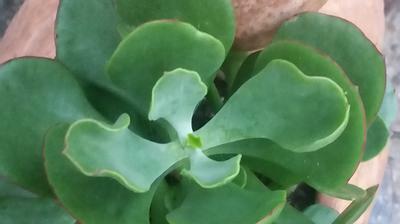 It's definitely Kalanchoe - the opposite leaf arrangement is a trait that they all seem to show. They are (as you've found) extremely drought tolerant, and heat tolerant too. They like water, in copious amounts, but then to be allowed to dry out almost entirely. See more about this species here. 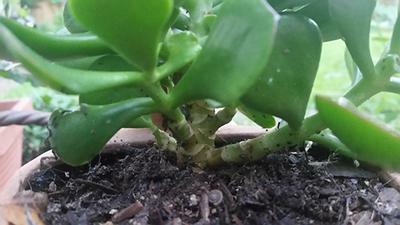 You most definitely can propagate it by cuttings, just make sure to let them callous overnight, and don't overwater them until they have some roots. 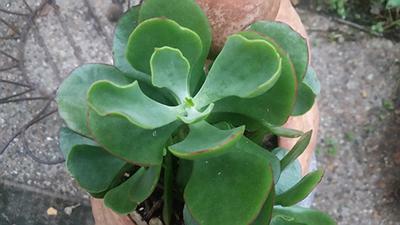 See more about propagation here.